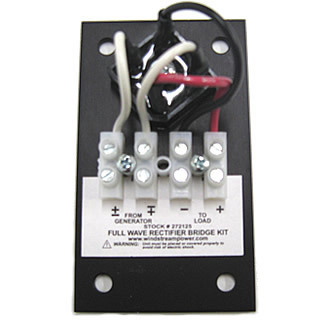 Note: All of the connecting cables used with our Human and Bike Power Generators also use the Full Wave Bridge Kit. We build these into an in-line, aluminum box. 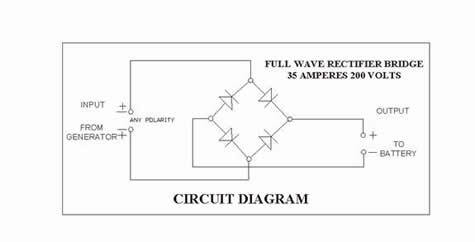 To permit the DC generator to rotate in either direction while providing a constant polarity output. Connect the generator wires to the two screw-down terminals marked "FROM GENERATOR". Connect the battery or other output load to the two terminals marked "TO LOAD". Attach the mounting plate to a suitable heat sink (aluminium is a good choice) using the four holes in the corners if the plate, preferably using silicone heat transfer compound to reduce the thermal resistance.